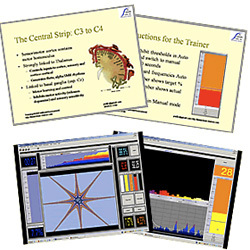 I would always start this kind of client with training how to do RSA breathing to move her into parasympathetic mode, using something like EmWave to provide her feedback in that direction (heart-rate variability training), and HEG for a session or two while you are getting a training plan for the EEG. Chances are that a person with adrenal fatigue has had so much cortisol in her temporals for so long that they look like Swiss cheese, and she is suffering lots of memory problems. Rebuilding cortisol production may not be a great idea until she actually begins to shift back out of her sympathetic arousal. The assessment will tell you which patterns are related to keeping her in that state. Â She may have hot temporals or right/left reversals or front/back reversals or high levels of fastwave coherence or a burnt out cingulate or a variety of other things. You should also recommend that she look at some of the dietary supplements that help to rebuild adrenal function. Especially B vitamins are very important. One of the things that happens as people age and begin to develop age-related cognitive decline related to slowing of alpha is problems with sleep. If a person is going to sleep okay and sleeping through the night but just not rested, that would usually suggest that he is not able to get into REM sleep and stay there, which usually relates to an inability to sustain beta. Certainly training to reduce 2-9 and reward 9-13 with eyes closed or 13-21 with eyes open on the midline and left. Whether the sensitivity is a cause or result of limited ability to control the interface between the internal and external worlds, I have no idea. Most likely, in a complex-adaptive brain, it plays both parts in a feedback loop: the high sensitivity demands too much of the filtering system, causing it to fail, and the failure of filtering results in too much traffic which increases excitation. Early on I recognized the relationship between allergies/asthma and hyper-immune responses. Environmental phenomena that most brains ignore as a threat, triggers excessive immune responses in these brains. This hyper-sensitivity/lack of screening has a sensory element as well. Light/sound/touch at levels perfectly comfortable to most people can be unbearable to brains lacking Filtering. And it involves hyper-reactivity–lack of editing function–with speech and actions leading to impulsive responses–acting or speaking without thinking. Furthest out on the Filtering continuum are brains in the autistic spectrum. The thalamus is a sensory gating facility. We could call it the Chief of Staff to the President, which determines who gets in and who does not, for how long and how often. We know the Chief of Staff doesn’t make these decisions without guidance from the President–he’s a functionary, not the boss. And we know the thalamus gets its guidance from the prefrontal cortex. That’s the connection between so-called “ADHD” and these other issues. When the PFC is not up to the job–or can’t handle it when the flow of demands gets higher–the system breaks down. In many cases it is very recognizable that when a client can move freely or is in a situation with limited sensory “noise” or where his brain’s normal “scanning” function is appropriate, he is highly functional and may even excel. The state is not dysfunctional. But it is severely limiting, if it is a brain’s only option. Hence, HEG/LIFE training is a powerful tool in helping the brain broaden its options. The thalamus, in addition to being a filtering station for data entering the cortex to be processed, is the brain’s most prominent rhythm generators. Like a drum machine, it contains nuclei that produce slow theta (4-6 Hz), slow alpha (8-10 Hz), fast alpha (10-12 Hz) and (in the sensory-motor cortex between C3 and C4) so-called Sensory-motor Rhythm (12-15 Hz). Brains with Filtering patterns often show lots of slow theta at C3/Cz/C4. We can’t see the sub-cortical thalamus on a cortical EEG, because it doesn’t have pyramidal neurons, but we can read on the surface how activated it is by looking at the relative levels of theta (least energized) and SMR (most energized). Hence, training to increase SMR while decreasing theta (and high-beta related to high levels of excitation) in the sensory-motor cortex can improve the function of the Chief of Staff. The BAL4C RH bipolar protocol combines trainings to reduce sensory sensitivity, motor reactivity, runaway thinking and emotional instability all in one. As such, it can be hugely important in helping to solve the problem on the excitability side. Reducing this while improving the screening function at both ends, should make a significant difference in a brain’s ability to operate much more successfully in commonly-experienced situations. If someone doesn’t produce alpha, train up 9-13 Hz–and train alpha coherence–in the parietals. All this, of course, assumes that you’ve already checked for other issues related to fast wave blocking and worked on those, since alpha and beta are antagonists–they block each other. General anesthesia will affect the brain, slowing it down signifcantly–and also usually over a period of time as well. 1. Hot right side: beta and high-beta levels about 14% and 10%–often significantly higher–and often reversed L/R anywhere from F to P.
2. Anomalies at F8: this emotional regulation area may show high levels of slow, unblocked alpha or, occasionally, even beta/high-beta. Sometimes a very hot area here connects with a very repressed emotional state and very withdrawn social pattern–but that’s not always true, especially if there’s a lot of fast activity on the right side pretty much front to back, it can also relate to emotional explosiveness. 3. T4 especially quite hot. 4. Sometimes a completely shut down prefrontal area. If 1 or 2 are not present, then I’d focus first on the temporals (assuming they are hot). The midline/cingulate would be more likely to show obsessive thought or compulsive behaviors unless it shows a differential in slow activity (indicating it is burned out). Ordinarily I would recommend trying something like the M2/Fp1 SMR% up protocol to calm that area and move it into a more functional state. I would not train Fz and Oz (2-channel protocol), because you are training two polar opposite areas of the brain at the same time. Fz and Cz or Cz and Pz (or FCz and CPz) referenced to opposite ears and linked would give you a good effect on the Cingulate. If you want to increase alpha, though, why are you considering training up the beta range? Final point: rather than deciding how you are going to train based on the assessment, I would strongly recommend deciding based on a test of the hypotheses produced by the assessment according to which has the most positive effect. With explosive anger, I’d often expect to see beta and/or high beta reversals with the values on the left side up at 17/10% or well above; alpha problems (lots of slow alpha or alpha that doesn’t block); or high levels of fast-wave coherence, especially frontally, could also be present. One of the issues to explore is whether there is a sudden, explosive nature to the anger, that seems to come and completely overcome the person, completely out of proportion to any provocation. If this is true, you may be looking at temporal lobe seizures. These are generally sub-clinical seizures, but they cause the temporal lobe to “lock up.” As with most such activity, it won’t necessarily show up in the EEG unless you happen to be monitoring when it happens. If your questioning elicits indications that this explosive uncontrolled nature is there, then I would work at T4/Fp1, training up SMR. Otherwise, I might simply try some C4 SMR. There are many things that could relate to anxiety and irritability, including high fastwave coherence in the front and central areas, excessive beta and/or high beta on the right hemisphere, reversals of beta left/right or front/back, a hot cingulate, or alpha problems. Training SMR will nearly always have A fairly immediate symptom-relief effect, but it won’t have a longer term result with other problems that underlie the symptoms. I’ve been playing around with anxiety problems for quite a while. There are a variety of brain patterns (right/left beta reversals, front/back beta reversals, hot temporal lobes and even alpha issues. The question for me is whether there is a distinction between what we might call physical vs. emotional anxiety. It appears to me that much of what I see is the emotional version. These are folks who can’t stop thinking, hold a generally negative view of the world (or at least themselves), and/or tend to be highly sympathetic (fight or flight). However in looking back at clients who have baffled me, I find another possible category. These are people who don’t necessarily show the more common issues of emotional anxiety (or may) but have a primarily physical presentation, such as panic attacks or migraines. These seem to be a different way of expressing the same energy, but many of these people are more parasympathetic with a tendency to freeze in stressful states. I see panic attacks as rebounds of the sympathetic nervous system, usually related to long periods of experienced stress. Breathing (especially RSA breathing, slowing the rate to about 6/minute) and the potential use of heart-rate variability training (with something like the Freeze-Framer) can both be helpful in terms of re-establishing some strength in the parasympathetic branch of the autonomic nervous system. It’s also likely that there are activation patterns in the cortex (e.g. hot temporal lobes, reversals, etc.) which represent brain strategies for dealing with this sub-cortical drive, and EEG training should be oriented toward melting away these patterns. I would always suggest doing an assessment and seeing what is there before just grabbing a training recipe. There may be excessive posterior beta, excessive right side beta, high levels of beta and high-beta all over, high levels of alpha, alpha that does not block when eyes are opened or poor alpha posteriorly (or others, I’m sure). Training the thing that is there which fits with the symptom pattern is, at least in my experience, the surest and quickest way to get a response. Don’t, however, just do relaxation training, as you’ll discover quite quickly that relaxation usually triggers panic attacks rather than avoiding them. Essentially the way to change autonomic activation is to teach the client to breathe and still the mind. I prefer RSA breathing, which focuses on exhaling very slowly and counting the seconds mentally, trying to completely empty the lungs in 7 seconds. Then let the air come back in and continue counting (usually for 3 seconds. 1. It eventually (over several breaths) improves the turnover of O2 and CO2 in the lungs, especially oxygenating the bottom third of the lungs, which often doesn’t happen with rapid or shallow breeathing related to sympathetic (fight-or-flight) states. When the body–and especially the brain–are under-oxygenated, they have every right to consider that a potential emergency. 2. Maintaining the count and focusing out of one’s head (on the belly and the breath) break up the chattering of the so-called “monkey mind”; asking the client to also count the number of breaths (on his/her fingers) quickly makes it clear when thinking has re-started and interuppted the focus. 3. Slowing breaths to 6 / minute activates the vagus nerve and shifts the ANS to parasympathetic mode. You can use technologies like peripheral biofeedback (finger temperature, GSR, etc.) to demonstrate to the client that results are happening in the body. Heart-Rate Variability is another, currently more popular, way of doing the same thing. I use diving in the LIFE game to demonstrate the change. I ask a client to try any of these without suggesting any approach. Often the result is frustrating and disappointing. Then I teach the breathing technique and ask them to close their eyes and focus on counting the breaths. Usually within 15-30 seconds I can pause the display and ask them to open their eyes to see the dramatic change that has occurred in the game’s display. I ask them if they notice a change in how they feel, in the noisiness of their mind. Then we return to the feedback. Doing this in sessions is helpful, but if the client is really motivated, I ask him/her to practice it 4-6 times a day (or more if they wish) for 2-3 minutes each time. I suggest that, since parasympathetic mode is related to body maintenance, they set up triggers to remind themselves to do the breathing. When they wake up in the morning, start the day, sitting on the side of the bed, with 3 minutes of breathing, before each meal, when they go to the bathroom, before going to bed at night. I point out to them that they can do the breathing with eyes open and no-one even knows they are doing it. But it moves the body into a state wherein it can perform its functions more effectively. And each time they breathe, they are dropping their stress levels back down several notches, so 4-6 times during the day can have a significant impact on how stressed they are by the time they go to bed. It’s also a great time to practice when you are driving a car (not with eyes closed). Focus on the breathing and you will drive calmer and safer. The same effect occurs if you breathe consciously when you are in a situation where you are feeling attacked by a boss or family member, etc. You can hear what the person is saying without exploding into an angry response which probably makes resolution less likely. Each time the client comes for a session, I ask for a report on how many times they did the breathing since the last session, when they did it, what they noticed. These are techniques to help shift the balance of time spent in sympathetic and parasympathetic, and that can begin to change the brain’s habitual level of autonomic tone. Another thing I ask the client to do is to identify areas of stress. Stress, I explain to him/her, is an internal response to a situation where you feel the need to control something more than you can. Learning to accept that most of what happens outside ourselves is also outside our control is an important step. Whenever a person begins to feel stressed, I ask that they ask a simple question: Can I control this? Traffic? No. Political situation? No. Children’s behavior, especially as they grow older? No. Spouse or friends or service-givers, etc.? No. So what you can’t control, you deal with. Not getting angry or stressed out makes it a great deal easier to deal with what’s in front of you. In my experience, I tell them, people who are least able to control themselves are the ones who most want to control everything else. It’s a huge waste of emotional energy that is almost guaranteed to produce negative outcomes. We look at different stressful situations they identify and have them imagine how they could respond differently and how that might change the outcome. This can be done during sessions, while training. But the bottom-line problem is that the brain has established a strategy for dealing with situations in certain ways. Those strategies are encoded in the energy patterns the brain produces. You can keep turning off the response (if you practice enough), but the brain will go back to it. So the brain training is about guiding the brain to releasing its habitual responses and shifting to more effective ones. The more the client learns to make conscious and to change those reactions, the more it practices reducing the level of autonomic tone, the easier these changes in habit patterns become. But in my opinion, the most efficient and effective way to achieve a lasting positive change is to combine them all–reduce tone, make controlling decisions more conscious and release old energy habits. Asthma is very often related to stress responses in an individual, so any of a half-dozen different brain activation patterns can be connected to it. Certainly the temporal lobes and the anterior cingulate area are good places to look for several of those, but they are not the only places. The assessment is designed to give you information about many of the different potential patterns that have been correlated with behavioral issues a client may want to change. I don’t use the term ADD/ADHD any more than absolutely necessary. It is so broad as to be almost meaningless–rather like saying, “we’re having soup for dinner.” It’s technically accurate but not very descriptive, covering such a broad range of behaviors and problems that I would have a hard time saying what one should do to train it. Is every “ADHD” client you see the same? The people who come to me with that diagnosis are so different that I find the diagnosis basically worthless. One sits quietly in a chair and looks at you but doesn’t hear anything you say, can’t complete a task because he keeps going into his thoughts. Another can’t stay in his chair, looks all over the room but hears everything and completes tasks but so fast that he makes many mistakes. They both have the same diagnosis. In the brain-trainer system we split ADHD into two groups that are ends of a continuum: Filtering and Processing. Filtering people can’t manage the interface between the outside world and their inside world. They are easily distracted by things around them, act and speak impulsively, often have quick mood changes, often have difficulty falling asleep, move around a lot in bed and may grind their teeth. Many have allergies or ashtma. As they get older, they are more likely to experience anxiety. Processing people can’t maintain their attention outside their heads and have difficulty processing language. They keep drifting away into daydreams, are very creative and intuitive but can’t process things in sequences and have difficulty with details. They often sleep very easily but have a difficult time waking up. They are more likely to wet the bed. As they get older, they are more likely to experience depression. Part of the problem may well be the endemic and poorly defined diagnosis of ADHD. When guys like Dan Amen are able to subsume almost every malady known to man under ADHD, we have lost most of the intended precision that language is supposed to have. Anxiety and depression and rage effects, inattention and hyper-focus, hypo-activity and hyperactivity are all part of the same diagnosis. It’s a nice marketing tool, but it’s not much help to those who want to train for changes. Anyone who believes that simply training up beta and down slow activity on the left or SMR up on the right will resolve ADHD (whichever flavor a person presents) is likely to experience a fair amount of disappointment. That’s the reason I so strongly recommend forgetting the diagnosis and looking at the connections between the desired behavioral changes and the brain’s activation patterns. Someone who does that is much more likely to deal with the underlying issues and get lasting results. Do you suppose a person who was emotionally upset because of fights between parents at home–or post-divorce–or bullies at school–might have difficulty paying attention? How about an adult with a history of trauma, or pretty strong anxiety, or inability to sleep effectively, or a level of depression, or obsessiveness that made it difficult to complete a task or a noisy mind or any of a dozen other things. Attention and memory, which are probably in the top 3 issues for every client who comes for training–even those who admit in their Client Reports that they have serious issues in one or more of these other areas–are third-level problems for many clients–and most adults. Anything can destroy your ability to focus and pay attention to relatively uninteresting (to you) stuff over a period of time. And anything you weren’t paying attention to when it came in won’t be remembered. Or if you have difficulty sleeping properly, it won’t be remembered. Or if your hippocampus is Swiss cheese because of long-standing levels of high stress dissolving them with cortisol. Look at the whole brain instead of falling into the “take an aspirin for a headache” simplification. See what’s going on, especially at the more primary levels related to subconscious drive and autonomic function, work on that and remarkably most problems with memory and attention will get better. If you are working with a young child who has difficulty sitting still and focusing even on the screen, then finding the appropriate calming/SMR frequency at C4/A2 or Cz/A2 can give you a very good starting point–getting the parents excited about some sign of control on the child’s part. It can also get your client to the point where you can actually assess the brain to see what to train. 12-15 or 12-16 Hz are good frequencies for SMR with adults. Most children will have a lower frequency, and the younger they are, the lower the SMR band is likely to be. Using BioExplorer, you’ll be able to adjust the band on-the-fly, during the session, so you can adjust until you find a frequency where the client calms. F7 and F8 offer some potential benefits. F7 is, among other things, an impulse control area and F8 can be helpful with social regulation and emotional inhibition–often issues with kids who get the ADHD label. But the problem with just throwing a windowed squash at those areas is, without having done much assessing, you don’t really know where to put the window. You can easily end up training too high and have the same kind of results that were mentioned by a previous trainer: the client becomes MORE disregulated, rather than less. For training attention and self-control issues, HEG is always a good option, fast and easy to set up and easy for the client to do. Then training in the sensorimotor cortex (between C3 and C4) can be very helpful. If you are training C4/A2 or Cz/A2, you will usually inhibit slow (2-9 or thereabouts, depending on the EEG) and fast (19-38 Hz) and reward SMR. If you are training bipolar (e.g. C3/C4, then usually you will inhibit 2-38 to quiet the whole EEG and increase 12-15. It is important to recall that, if you accept the brain-trainer concept that, as the Othmers noted in the mid-90s, there are plenty of people with impulsive or hyperactive type ADHD (the type we call Filtering) who have LOW theta/beta ratios which rise (into the target range) at task (or with training). Since many of these also have little or no alpha/SMR–middle frequencies–this metric will have the same weakness that the Lubar/Monastra theta/beta ratio work has. It will pick out those with a high level of inattentive issues but not necessarily capture those with distractible/impulsive problems, many of whom do NOT have learning or language processing concerns. I don’t think the issue is tonic (standard state) vs. phasic (activated state). Tonic levels of arousal can be too low–or too HIGH. Either way, performance will suffer. Low tonic levels would be consistent with what the TQ calls Processing problems–dominant slow activity and often a tendency to de-activate (increase theta/alpha levels relative to beta at task). High tonic levels would be related to what we call Filtering problems—lots of slow AND fastwave activity but lacking middle frequencies–and many clients in these cases actually de-activate at task…and become more effective and functional. I don’t think there’s any confusion about this. Anyone who works with arousal issues can certainly agree that there are underaroused (primarily inattentive) and overaroused (impulsive/hyperactive) people who fall into this rather broad diagnostic category. Why would we expect that a child who can sit in a chair for hours during a class, staring out the window, without bothering anyone, drifting in and out of contact with the task at hand would have the same brain activation patterns as someone who cannot stay in a chair for 2 minutes, is aware of everything around him–even hyper aware in some cases–and tends to be a sharp, fast multi-tasker? That makes no sense intuitively. In the early days of the 90s, when I was working closely with Joel, we used FCz/CPz one-channel bipolar montages with theta down and beta up for inattentive type, and C3/C4 theta and high-beta down and SMR up for greater control. We also trained at C3/A1, Cz/A2 and C4/A2, so I don’t think Joel was fixed on any one thing. I try different options and find which tends to work best. Lubar (and I was one of the co-authors of the early study with Monastra on the T/B ratio of 4-8 Hz / 13-21 Hz) focused much more heavily in his practice on the inattentive type client. Meanwhile the Othmers, who were still in their extremely valuable sensori-motor cortex phase, worked a great deal with the hyper-aroused kids. When I studied with them in 1994 or 1995, they commented that they had no idea what Lubar was talking about with his high theta/beta ratios. Their experience was that many of their clients had LOW ratios (more dominated by beta) and actually increased as the training progressed. The more I worked with the “ADHD” population, the more I realized they were BOTH right. This is a subject that is normally kind of taboo. After all ADHD was one of the starting points and one of the most-researched areas for training, especially with children. It is one of the major sources of clients for many trainers and one of the main draws for many parents who get into the field to work with their own children. I personally agree. Maybe I’m just getting too old, but I find that increasingly I would a dozen times rather work with an anxious adult (or child) than with a hyper-active or just ADHD client of any age. Not because I find the ADHD folks more unattractive or that I don’t like their energy levels, etc. I just don’t find I get as clear results as quickly (or sometimes at all) with the ADHD. Certainly there are some who respond well to HEG. Others calm right down with SMR training that tracks to find their “right” frequency for SMR. But there is a significant population of these people who come bouncing in session after session, do whatever training you give them to do (though often with complaints of boredom, difficulty staying in the chair, having to touch everything, mess with the computer, etc. ), seem to calm down (even for a time) during the session, then bounce right back up and require a team of sheepdogs to get them out of the office without careening into everything they should not touch. Question: Has anyone tried or had success with Joel Lubar’s placement at FZ for ADD, reward 16-22, inhibit 6-10. It was recommended by Lubar in a 2001 workshop. Answer: I think Joel speaks of this as working with adolescents, not younger kids. Like any “one-size-fits-all” protocol, it will no doubt work well with some clients and not so well with others. What is the reference for this hookup? We used to use a protocol for beta up/theta down between FCz and CPz. This would be likely to work on the executive attention center and the medial forebrain bundle, which brings dopamine forward, so it you had a straight ADD/ADHD kid, it might have a good effect. Monastra, Lubar et al published in Neuropsychology in the mid 90’s a large multi-center study that showed Theta/Beta ratios (4-8 Hz/ 13-21 Hz) that purported to be the cutoffs for various ages for ADHD. My practice was a major participant in that study, and I’ve always had problems with it, because it assumes that there are only ratios that are “too high”; we saw, and I still see, many people whose ratios were very low, who also had problems with attention, anxiety, obsessive thinking, etc. Theta and beta relationships are good to look at, but so are alpha and theta. Some people like to look at SMR to high-beta ratios as well. And there are others. I think of any of these as being descriptive rather than diagnostic, but certainly many people who prefer the diagnostic model use them that way as well. “We tried to treat an extremely broad diagnostic category using a single protocol. To me, that doesn’t suggest that there are people who are “resistant” to Nf. Rather there are people who don’t respond to one specific training. That’s not a big surprise, is it? That’s why we look at the brain before we train it–to see what approaches are most likely to work. That’s why we train multiple different protocols in Whole-Brain training. Our interest is not to discover a measure that highly correlates with “not responding” to NF. It is to define an approach to training ANYONE (including ADHD) that results in changes, no matter what the patterns. For example, since they did not train coherence at all, why would they expect that training SMR in the sensorimotor cortex would change excessive coherence in beta? Would those kids have responded if they HAD been trained to reduce locked-up beta? That would be an interesting question. Finally, ADHD is an almost useless diagnosis. It is a description of commonly-occurring symptoms that can result from any number of brain patterns. What is ADHD? The person can’t pay attention, or can’t sustain attention in busy environments, or has difficulty controlling behavior in such environments, especially when expected to sit quietly. What causes it? We don’t know. There are MANY things that can make if difficult for one to sit quietly for hours processing language as the only way to learn or work. But they are all subsumed under this one category. Since we know that each of those possible approaches to experience listed above is likely to link to one or more different patterns of brain activation, we wouldn’t expect that any one protocol would work with every client. It’s ridiculous. There are many people working with autism in its various forms who use the TQ. You’re talking about brains which are extremely disorganized. Certainly coherence and timing issues are part of that problem, and perhaps I’m not up to date here, but I’m not aware of any research that indicates that front/back connectivity is a greater or more basic problem than any of the many others involved. Many folks who work with Autistic Spectrum who don’t do any assessment to get started: they use tried-and-true recipes—mostly bipolar—to start creating an area of improved function in the brain from which they can start building. These can be very helpful in providing the client with improved control over the screening functions that are usually the most basic issue. Doing a TQ can be very helpful after the initial layer of difficulty has begun to respond. Keep in mind that with a general brain problem like autism, worrying about specific behaviors is probably a waste of time. As the brain gains greater control and stabilizes, behaviors will go away. HEG is usually the simplest to start with. Have the family start the client practicing wearing a baseball cap around the house. I use the one with the adjustable size, starting with a very loose headband. He wears it 2-3 times a day for a minute or two and works up. The HEG headband is pretty easy after that and takes almost no time to put on–or re-apply. This will be much easier for a sensory-defensive young person to get accustomed to, no prepping or sticking electrodes on with paste. It will help to get the prefrontal activated, and improving executive functions (such as screening sensory inputs and motor outputs) will be an important first step. If you do wish to do EEG, I believe Mark Darling, who has worked a good deal with young people in this population, has written that a bipolar 1-channel hookup at T4/P4 would be a good place to start. You will inhibit 2-5 Hz and 19-38 Hz and reward starting perhaps around 12-16, sliding that band down until you get some kind of response. If you haven’t seen the video Training ADHD without an assessment, you may find that helpful, as ASD is a very extreme Filtering problem–at least the first few layers. High fast wave coherence in the back of the head is a common finding in autism, where sensory defensiveness is often an issue. Asperger’s clients often seem more to use the blocking strategy, the obsessive and compulsive characteristics, than this dissociative one, but I’ve only worked with maybe a half-dozen of them. This population, with Tourettes, PDD and closed head injuries, among others, has always seemed to me to cry out for a home-based machine. When the sessions can be done at home, length is less of an object and the client can do literally hundreds of sessions over years, which is often how the really astounding improvements come about. I’m aware of several folks who have trained bipolar one-channel montages just below O1 and O2, at the top edge of the inion ridge, for balance and gait issues (certainly cerebellar issues) and claim to have gotten very good results. They used a bipolar and inhibited 4-7 Hz while very mildly reinforcing 15-18 Hz activity. The EEG amplitudes are very small at this location in comparison with other places on the scalp, and the thresholds for reinforcement are adjusted accordingly so that the person is receiving ample reinforcement. They trained for 30 minutes. This protocol has been around for many years. It essentially places the electrodes on either side of the cerebellum, and it theoretically it makes no sense, since the cerebellum does not contain pyramidal neurons, which are the source of readable EEG signals However, it has been reported anecdotally to have a positive effect in many reports I’ve seen. BTW, instead of asking a person to rate his own balance subjectively, it would be easy enough to put them on a Wii balance board and have the computer track it (and changes in it). My experience has generally been that enuresis responds well to speeding up the left side of the brain, either by reducing slow activity or by training up beta (or both), depending on the client. This is especially true of bed-wetters who fall asleep easily, sleep too deeply, and are hard to awaken in the morning. They essentially cannot produce much beta (you should see high T/B ratios), so when they fall asleep, instead of cycling down to delta sleep and up into REM (where they are close to the waking state and can wake themselves up if necessary to go to the bathroom), they stay in deep sleep, almost like a coma, and don’t get the body messages. As they improve their ability to cycle, they become easier to awaken in the morning, and they stop wetting the bed. Of course, bedwetting can also be an emotionally-triggered event–as it may well be in the population you work with. And it can have psychological overtones (“do you still love me”). In those cases you might be oriented more toward trying to dampen the emotional overdrive in the temporal or parietal areas to un-dampen the sheets. (sorry). Children like this often have slower brains in that they are more dominated by delta and theta activity. Slower brains are perfectly “normal” in younger children, so it’s fair to say the child’s brain has not matured to an age-appropriate point yet. Training down 2-5 Hz at C3 and/or C4 may be helpful. Trying 2-5 down and SMR (wherever that turns out to be for him) at C4/A2 may also help. And, once you have a handle on SMR, I’d try some beta up and 2-5 Hz down at C3/A1. Bell’s Palsy is usually related to an injury to a cranial nerve. If you can’t identify a source of the injury, chances are it was fairly minor and should improve by itself fairly quickly. There is a correlation between immune system weakness and recurrence, so trying some alpha training at P4 or O1 might be a good way to work with it. It won’t likely change the nerve regeneration rate, but it may help her feel more relaxed while that’s happening, help her immune function and generally feel good. None of that is bad. There really isn’t a recognized pattern for bipolar on the TQ–or in the QEEG to the best of my knowledge. There is some indication that it may be, like other affective issues, a Tone problem. When the Autonomic Nervous System is stuck in Sympathetic mode, the client in manic; due to adrenal exhaustion after a period, the client collapses into the depressive phase. Since there is not (to the best of my knowledge) any identified brain activation pattern for “bipolar”, and it is such a popular diagnosis, I don’t see how anyone could give you much of a rationale for not training ANY protocol with clients who happen to have picked up that label in their wanderings through the mental health system. I would have to say, however, that I’ve seen a lot of adults diagnosed bipolar who appeared to fall into the Filtering/Control category–and responded nicely to that approach. All that oscillates is not bipolar. Bipolar has gone from being quite a rare diagnosis in the early 90s, when I first started training, to being quite trendy a few years ago. I saw some data recently that in the decade from 1993 to 2003 the number of kids diagnosed as bipolar went from 20,000 to over 800,000–a 40 times increase! A lot of people–especially kids–who were emotionally labile and angry (in the 90s they were part of the explosion in ADHD–another diagnosis that a decade earlier began suddenly to afflict many times more children)–now get dumped into the bipolar category. This is rather unfortunate since psychiatric diagnoses have a nasty habit of sticking around throughout a person’s life on academic and medical records. ADHD is bad enough, but bipolar disorder is a psychosis of sorts. Of course that means that a child can be given the latest cocktail of stimulant/anti-depressant/anti-psychotic powerful psycho-active drugs, but it also means that they’ll carry that label into adulthood. Even professionals who believe the diagnostic explosion represents a “maturing” in the field of psychiatry (?!) frankly admit that no-one has any idea how many, if any, of these children will actually “have” the disorder when they become adults–kind of a strange thing to admit regarding a disorder that until 10-15 years ago was ONLY considered to be diagnosed in adults. I asked Jay Gunkelman–a guy whose ability to read a QEEG and tell you about a person he’s never met borders on witchcraft–a few years ago about EEG and bipolar. At that time, he didn’t see it as related to brain function so much as to excessive autonomic cycling: when the ANS tilted into sympathetic mode, there was a manic period; when there was adrenal exhaustion, you saw the depressive phase. Here as in most other areas, I strongly believe that if you are capable of working at the level of the brain’s own activation patterns, you can safely dispense with the labels. I don’t care if you are talking about “anxiety”, “depression”, “rage” or other diagnostic labels. The disorder titles are essentially descriptions of symptoms–NOT an indication of what underlies the symptoms. There are probably 6-10 patterns that have been shown to occur in people who are anxious, probably about the same number in people who are depressed, etc., so the diagnosis is useless in terms of telling us how or where to train. If you want to change a person’s ability to perform/behave/feel/learn in some stable way, then define the specific behavioral issues that client wants to change and look at the EEG for patterns (using a TQ or a QEEG or whatever brain-based assessment you choose) that have been linked in research to those behaviors/moods, etc. Train to change those. It’s important to be careful with bipolar clients, however. A protocol that might have a positive effect if you use it when the client is depressed can have a very negative effect if you use it when he is shifting toward manic. Question: Will an assessment look significantly different if measured when the trainee is up or down in the bipolar cycle? Answer: Always do an assessment–you can try one when manic and one when depressed if you wish (if you can get the client in when depressed) and tell us what you find. I have become downright cynical about the bipolar diagnosis, since it is so common and rather subjective. A lot of the kids who I worked with as ADHD (mood swings are a common factor in ADHD, as is risk-taking behavior), if the parents were willing to spend enough getting diagnoses would end up with a bipolar diagnosis to put on the resume. Since more and more physicians have begun tossing anti-psychotics like Risperdol into the mix (with stimulants, anti-depressants and anti-convulsants) with even ADHD kids, I don’t see why they need to toss a heavy diagnosis like bipolar disorder onto the client’s back, but it is pretty common. There are two type of damage that can result from head injuries: damage to gray matter (the neuron cell bodies) or matter to white matter (the neuron connective filaments). Gray matter damage results in loss of neurons, no matter what speed they were firing, in an area. Areas of very low amplitudes overall relative to surrounding and homologous areas relate to gray-matter damage, literally a killing of the neurons, so there are many fewer producing the electrical pulses we read as EEG. Comparing one site with its mirror site (say, C3 compared with C4) you might see a significant difference in the amplitudes at most or all frequencies, with the low side being the damaged side. It is my understanding that over time many brains can repopulate these areas, so gray-matter injuries can resolve with time. Low amplitudes on one side suggest a gray-matter head injury at those sites. Alpha spikes secondary to head injuries (gray matter) are common. As damaged neurons are replaced they often lock into alpha without the connections the old ones had. If EO alpha is high–higher than theta and delta–then there is a problem with alpha blocking–no matter how much it has come down. I would look for EO Alpha Theta ratios in back at or below 1.0. As I’m sure you know, a blow to the back of the head can often result in a contra-coup injury, where the brain is slammed forward into the skull on the opposite side–the prefrontal in this case. When alpha shows a spike at a site relative to the rest of the head, one of the first things to rule out is a closed head injury. Gray matter damage (neurons, not axons) results first in reduced amplitudes in all frequencies (fewer neurons to fire), but as the neurons are replaced the amplitude comes back—though the connections don’t—and it’s not uncommon to see a spike of alpha. White matter damage doesn’t kill the neurons; it just cuts them off from the rest of the world–like a whole class of high school students all losing their cellphones. With no incoming or outgoing communications, the cell tends to drop to the lowest frequency of the brain–the incommunicado frequency we see in deepest sleep–Delta (and often very low theta). Areas of very high delta relative to surrounding and homologous areas relate to white-matter damage, a shearing of the connections, which leaves neurons as little islands of activation with no inputs or outputs. The delta is projected from the brainstem when nothing else is happening. The problem with axonal shearing is not loss of the myelin sheath. It is the tearing of the axon itself. The sheath makes it possible for axons to carry faster pulse rates, assuming an intact axon, the “cable” coming out of the neuron to connect it with others downline. But if the axon is torn apart, then the neuron loses its ability to communicate with neurons with which it used to connect. I can’t say whether or not the brain can replace myelin, but to the best of my knowledge–short stem cell or some other new and as-yet unproven approach–nothing creates new axons. Learning expands the trees of dendrites which receive signals from other axons and expands the links off the axon to allow it to connect with other downline cells. But the axon, once it is gone, is gone to the best of my knowledge. Of course the amplitudes of these frequencies would be HIGHER on the side where the damage occurred. And white matter damage does not heal. I can’t find the source now (I’m pretty sure it was Jay Gunkelman), but I learned several years ago that these neurons over time can tend to shift up into the low alpha frequency, resulting in high amplitudes of 8-10 Hz instead of Delta. One of the most basic rules of training “injured” brains is that you do NOT train right over the injury. Work around rather than directly over the affected area. I have never found a huge benefit in localizing the level of dysfunction to a particular sub cortical structure, lobe or 10/20 site. In most cases it’s really NOT that localized. So training the whole left hemisphere or the left-frontal quadrant tends to require the brain to work the area that isn’t working so hot AND the surrounding areas that can pick up some of the load. I would think that wherever you have significant slow activity, which should show up on the assessment on the heads page, you would be very safe just to work with reducing slow activity. If you have fairly broad areas of slowing, then use a 2 summed channel protocol just reducing the most problematic band. 2-5 Hz is a pretty safe frequency, which is not likely to further impact memory. Damage to the left frontal cortex (around F3), resulting in excessive slow activity there relative to right, often results in depression; conversely, damage to the right frontal cortex (around F4), resulting in excessive slow activity there relative to left, often results in mania. It would seem that a true bipolar might shift back and forth between overactive left and then right frontal areas. With someone who has had not one but two aneurisms, I’d probably stay away from pushing faster speeds, but certainly SMR has been used very effectively with seizures, especially between C3 and C4 or at Cz in one channel. Excess coherence often follows a head injury. Brain-training is an energy intervention. It improves the brain’s ability to produce a range of energy levels, to reduce levels of inflammation and hyper-sensitivity, to communicate efficiently within itself, etc. There are physical issues like Parkinson’s (the death of dopamine-producing neurons), Alzheimer’s (physical blocks by amyloid plaques within synapses), loss of myelin sheaths on axons which slow down transmission in disorders like MS or ALS, white-matter brain injuries which sever neurons from the communication systems, etc. Training energy patterns cannot resolve these problems, though in many cases they can reduce the symptoms. Your son’s physiological brain issues can’t be “fixed” by changing energy patterns, but it’s very likely you will see improvements by helping his brain to learn to function more effectively in the physical environment in which it finds itself. It’s certainly worth a try, as there’s no good reason for expecting that it will have any kind of negative effect. It’s pretty common to see bruxism in folks with very low levels of SMR. They also tend to be rather rambunctious sleepers in other ways as well and may have sleep-onset insomnia. Try training SMR up (adjust to get the right frequency for the client) at Cz/A2 or at C4/A2. Burnout is not generally a mental issue (nor is it usually “simple”). The term suggests that the ANS, which kicks into sympathetic gear in response to stress, has gone beyond its ability to respond any more; literally the adrenals are burned out. Absolutely certainly you want to make sure that the client is taking some B-vitamin complexes (since cortisol burns up B vitamins), and it’s worth checking to see about the status of the adrenals, since there are some pretty good adrenal “rescue” supplements available that can help rebuild that part of the system. In addition to high alpha amplitudes and poor alpha blocking, it is important to see whether the alpha is slow. It is very common to see this pattern in clients who have not dealt with emotional issues, rather keeping them buried (or wrapped in alpha) over a long period of time. The burnout could well be related to adrenal failure, which occurs when the autonomic nervous system has been in sympathetic mode over a long period of time. Often we see problems where the unprocessed emotional material gets somaticized, and it may appear as chronic fatigue, chronic pain or even fibromyalgia. If the alpha is slow, below 10Hz, at the back of the head, you might try training faster alpha up at P4 with eyes closed. If you are using BioExplorer with our Design Subscription, you can use the 1C Alpha design to do this. If not, try training 2-9 Hz down and 10-13 Hz up.